The American Pitbull Terrier originated from an experiment of crossing bulldogs and terriers. Early breeders were looking to combine the game dog personality of the terrier with the athletic, powerful body of a bulldog. Pitbull Terriers were originally used to bait bulls and bears. Later on, they were used in the sports of ratting and dog fighting. Eventually, upon all these events being declared inhumane, the pitbull terrier found its way into the home as friendly family pets. 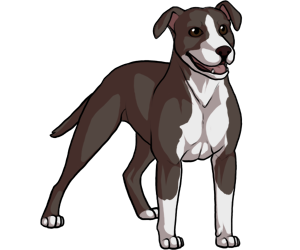 American Pit Bull Terriers with dilute coat colors have a higher chance of developing skin allergies. 14 out of the 25 dogs who have earned the UKC "superdog" status were APBT. Pit Bull terriers are currently the most over-bred dogs in America.